So, a big week ahead in the Commons as we return from our constituencies and all focus will be on the 'meaningful vote' for Prime Minister Theresa May's botched Brexit deal. Before that vote, though, there are many other important meetings and visits. It's important to know that despite Brexit dominating the headlines, I continue to get on with the day job too. On Monday, I'll spend the lion's share of the day in Scotland, kicking off with a visit to Glasgow North East Carers Centre in Easthall. 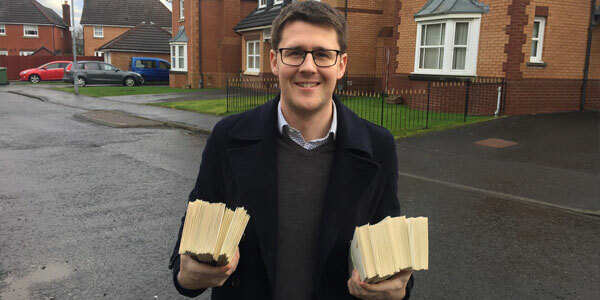 After that, I'll be doing my weekly door knocking, as well as delivering my New Year Resident Surveys. Before I head to catch a late afternoon flight to London, I'll be meeting with representatives from a number of Fibromyalgia campaign groups. Tuesday itself is the day of the big Brexit vote but that won't be until 7pm in the evening and there's a packed day of work to get through before voting time. In the morning, I'll be taking part in a parliamentary debate on Fibromyalgia. I've heard lots of testimony from constituents regarding this cruel condition, so I'm looking forward to standing up for you and making your voice heard. Thank you to everyone who has taken the time to email me. On Wednesday, it's back to the committee rooms for my regular Bill committee and select committee meetings. The Immigration Bill is also due to have its second reading debate in Parliament, so I'll be wanting to make a brief intervention in the chamber concerning that. All going well, I'll hopefully be able to get home on Wednesday evening by plane, ready for a busy couple of days of constituency work. Thursday morning kicks off with leafleting at the back of eight in the morning. With thousands of tenement properties in the East End, you've got to be up bright and early to make sure you can get through the the control entry doors before 11am without disturbing anybody! After leafleting, I'm looking forward to catching up with Alan Sherry, Principal of Glasgow Kelvin College (formerly John Wheatley College). Alan is due to retire later this year but has been an outstanding servant to the College sector, so I know he's going to be greatly missed. I've also got a number of other meetings back at the constituency office, as well as time set aside to deliver resident surveys. Friday is another surgery day and this week I'll be at The Bridge in Easterhouse from 10am, ready to provide help and advice to any constituents who require it. Later in the day, I've also got meetings with a number of organisations and fellow MPs and MSPs to take forward some campaign work on a national basis. I'm especially looking forward to meeting up with my constituency colleague, Fulton MacGregor MSP. Finally, the first of your 2019 resident survey responses will be returning in the post, so plenty to keep me busy! As ever, keep in touch on social media to see what else I'm up to.